Nestled in the undulating hills of Wailea in West Maui, among luxury homes and resorts and three opulently designed championship golf courses, is Mulligan’s on the Blue. An Irish pub might seem an unlikely fixture in the high-end environs of Wailea, but Mulligan’s will celebrate its 15th anniversary in 2016. Clearly, the friendly pub is a part of the community. Owned and operated my Michael O’Dwyer, a native of Ireland’s County Tipperary, Mulligan’s on the Blue enjoys a customer base that is almost equally local and visitor. The bar proper is impressive with high ceilings and elegantly carved shelves stocked with the finest Irish whiskeys. There is also a large indoor dining room and ample tables outside to enjoy the almost-always perfect weather of West Maui. Mulligan’s boasts 14 large screen HD televisions, but its similarities to generic sports bars end there. The bar and wait staff are smiling and accommodating, much like their counterparts on the Emerald Isle. O’Dwyer has hired many Irish transplants in his pub over the years, and one waitress with neon red hair gave away her Irish roots with a charming brogue. Railings above the windows and doors are lined with Jameson Irish Whiskey bottles. The afternoon West Maui sun dances through the doors at Mulligan's. Although the menu does feature standard bar fare like burgers and nachos, it offers a selection of traditional Irish favorites like shepherd’s pie, Irish stew, and corned beef and cabbage. The fish and chips are Harp-battered and made with locally caught mahi mahi. The portions are generous and reasonably priced. My wife, who is a proud member of the “Clean Plate Club,” couldn’t quite finish her colossal Reuben sandwich. 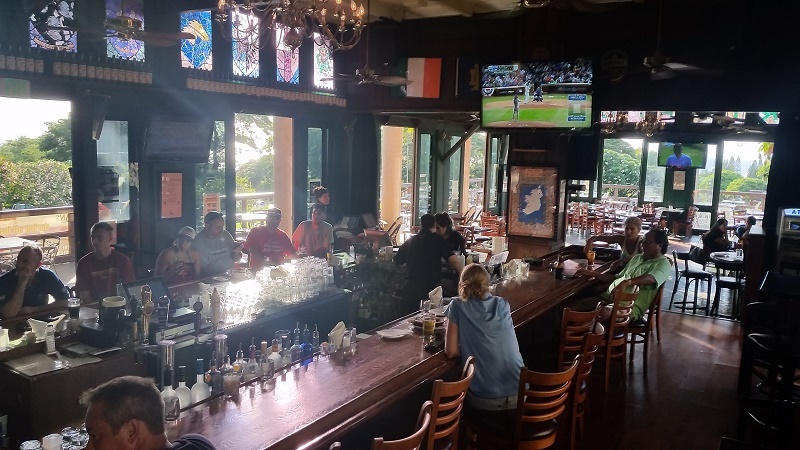 We went to Mulligan’s on each of the two full days we had on Maui, partly because of postseason baseball, but mostly because of the good food, excellent service, and low happy hour prices for food and drink. On both days, the bar was nearly full. Construction workers in for a pau hana beer shared the bar with resort guests and retirees, all seemingly familiar and friendly with one another. O’Dwyer himself chatted up patrons and made time to chat with my wife and I (we have mutual friends on Oahu and in Ireland). He told us stories about Dublin and Limerick before apologetically taking his leave to coach a team of “under twelves.” We assumed he was talking about soccer. As with all genuine Irish pubs, Mulligan’s on the Blue features live music. The Maui Celtic Tigers are featured every Sunday night, mixing traditional Irish favorites with more modern Celtic rock songs. Legendary Hawaiian musician Uncle Willie K does a regular dinner show at Mulligan’s and other acts include magician and comedian Brenton Keith, a Beatles tribute band, and singer/songwriter Andrew Corradini. Mulligan’s also hold special concert events, from Hawaiian music and reggae to soul and R&B and rock and roll. 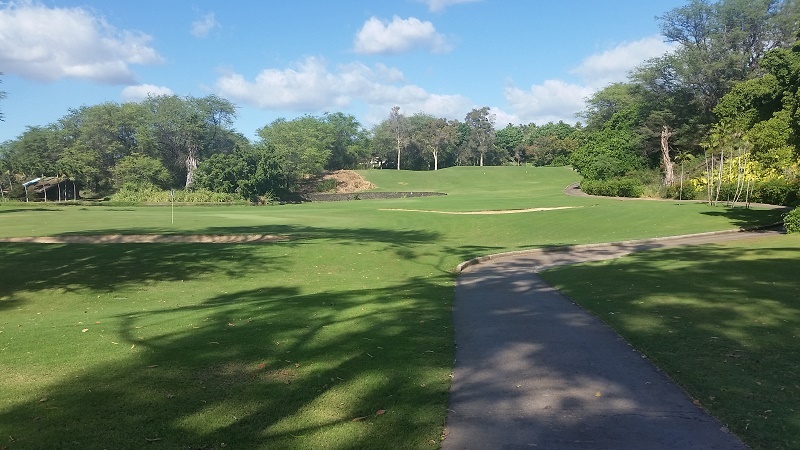 A picturesque golf hole just outside Mulligan's at the Wailea Blue Course. The smoking area outside Mulligan’s overlooks a picturesque par-3 hole on Wailea’s Blue Course. You can watch deflated golfers slink to the green or witness the greatest shot of a golfer’s life. I saw both over two visits to Mulligan’s on the Blue. My wife and I don’t spend a lot of time on Maui (it had been 18 years since my last visit), but we’re certain that when we return to Mulligan’s on the Blue we’ll be welcomed as regulars. You will, too.